According to The Nice and Accurate Prophecies of Agnes Nutter, Witch (the world's only completely accurate book of prophecies, written in 1655, before she exploded), the world will end on a Saturday. Next Saturday, in fact. Just before dinner. So the armies of Good and Evil are amassing, Atlantis is rising, frogs are falling, tempers are flaring. Everything appears to be going according to Divine Plan. Except a somewhat fussy angel and a fast-living demon-;both of whom have lived amongst Earth's mortals since The Beginning and have grown rather fond of the lifestyle-;are not actually looking forward to the coming Rapture. And someone seems to have misplaced the Antichrist . . .
have sold over 750,000 copies in both paperback and hardcover and Warner Bothers has optioned the rights to Sandman. Gaiman is the co-originator and co-editor of The Utterly Comic Relief, an organization which raises money to maintain First Amendment Rights for comic book creators. In 1991, the organization raised over 45,000 pounds for the Comic Relief Charity. 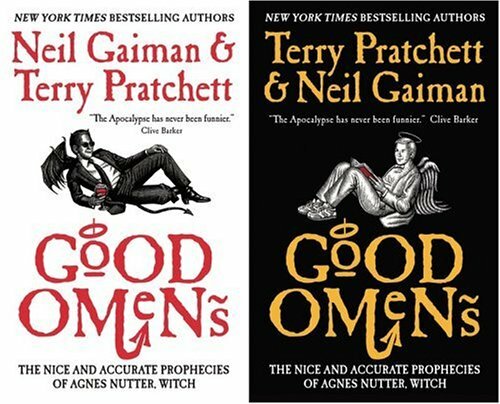 Gaiman has also co-authored a book with Terry Pratchet called "Good Omens" and wrote "Ghastly Beyond Belief" in 1985 and "Don't Panic" in 1987. He has edited a book of poetry entitled "Now We Are Sick" and his essays have appeared in such publications as "Horror: 100 Best Books and 100 Great Detectives." Gaiman's latest project has been the development of "Neverwhere," originally a television series for the BBC, it has now been expanded into a novel and is being made into a movie created by Jim Henson Productions. He has also delved into children's books, writing "The Day I Swapped My Dad for Two Goldfish" which was selected by "Newsweek" as one of the Best Children's Book of 1997. His last publications have been "Smoke and Mirrors" in 1998 and "Stardust," an anthology of short stories in, 1999. When not writing, Gaiman is constantly involved in fighting for the rights of literary writers of all kinds so that the First Amendment shall always be allowed for those who choose to write. proficiency class and also passed an A level in English while on day release. Pratchett had written a book called "The Carpet People" which was published in 1971. "The Carpet People" was followed by "The Dark Side of the Sun" in 1976 and "Strata" in 1981. He left the Bucks Free Press and started work for the Western Daily Press on September 28, 1970, he returned to the Press in 1972 as a sub-editor, and on September 3, 1973 joined the Bath Chronicle. At this time, he had also produced a series of cartoons for the monthly journal, Psychic Researcher, describing the goings-on at the government's fictional paranormal research establishment, 'Warlock Hall'. In 1980 Pratchett was appointed publicity officer for the Central Electricity Generating Board with responsibility for three nuclear power stations, where he was working when the first of the Discworld novels "The Colour of Magic," was published, in 1983. Pratchett's paperback publisher at the time was New English Library, who had published "The Dark Side of the Sun and Sourcery." "The Light Fantastic" was published in 1986, and Pratchett decided that he had to move to a major publishing house. He chose Gollancz, and they considered taking Pratchett onto their SF list, although they had never published fantasy before, only traditional SF, and struck a co-publishing deal for three titles, "Equal Rites", "Mort" and "Sourcery." In September 1987, soon after he had finished writing "Mort," Pratchett decided that he could afford to devote himself to full-time writing. His books for young readers, Truckers, the first volume of what is known in the USA as the Bromeliad Trilogy, was a landmark publication, becoming the first children's book to appear in the British adult paperback fiction best-seller lists. It was followed by "Diggers," "Wings," the revised version of "The Carpet People," and all three Johnny Maxwell books. Pratchett has also written a number of short stories, three of which have Discworld themes. He was appointed as an Officer of the Order of the British Empire in the Queen's 1998 Birthday Honours List in June, 'for services to literature'. In July 1999 he received an honorary Doctorate of Literature (D.Litt.) from the University of Warwick and granted doctorates of the Unseen University to Ian Stewart and Jack Cohen, co-authors of "The Science of Discworld," which had been published the previous month, and in 2001, one from the University of Portsmouth.